#2 of 3 being posted on April 22. This doodle is for April 21 in MUFHH and was doodled on April 21–I just ran out of time to post it. “Don’t Hurt the Lord” is the title of today’s devotional. Another mind bender and paradigm shift. Did you know that it hurts (grieves) the Lord when we get too complicated, doubt His word and don’t recognize His presence and power–NOW? Many of us have grown up looking for the “signs” of the return of the Lord or looking for guidance for the future instead of looking to our Lord for right now. We live for the future and not for the present–“Everything will be better when Jesus comes.” Oh how much we miss on a daily basis with our Lord because we fail to see Him standing in the middle of our day. Instead of stopping to say “hello,” we say, excuse me, but I’m looking for something bigger, grander, profound–I’m looking for Jesus–when all along He’s simply standing there and we’re pushing Him aside for something less simple and more profound. Don’t put off living in the NOW. “Let not your heart be troubled . . .” Am I…hurting Jesus by allowing my heart to be troubled? If I believe in Jesus and His attributes, am I living up to my belief? Am I allowing anything to disturb my heart, or am I allowing any questions to come in which are unsound or unbalanced? I have to get to the point of the absolute and unquestionable relationship that takes everything exactly as it comes from Him. God never guides us at some time in the future, but always here and now. Realize that the Lord is here now, and the freedom you receive is immediate. 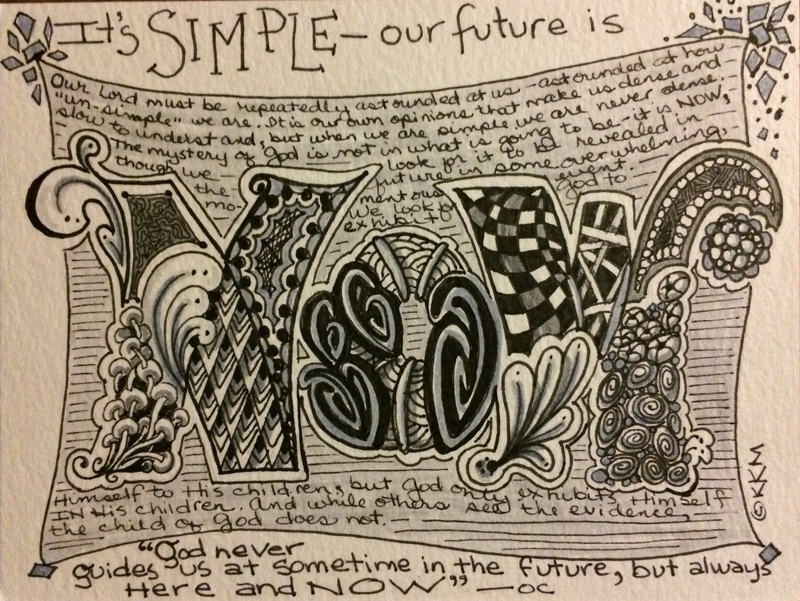 Live simply, simply trust–NOW is the day of our salvation–not some day in the future. Do you believe it?